Ghosn says Nissan has no plans to shift production to other countries, despite the problems in Japan. TOKYO -- Nissan Motor Co. CEO Carlos Ghosn said about 40 component suppliers in Japan remain in difficulty after the nation's record earthquake, complicating automakers' efforts to restart car production. Electronic components, plastics and rubber are in short supply and will affect Japanese automakers and rivals outside the country, Ghosn said Wednesday in a telephone interview. Japan's carmakers are jointly offering stricken component-makers support through Japan Automobile Manufacturers Association, he said. "This is serious and it's still difficult to evaluate," Ghosn said. "You have the earthquake, you have the tsunami, rolling blackouts, and fuel shortages hitting at the same time, and they aren't only hitting the car manufactures, but also the suppliers and the dealers." Nissan and Japanese rivals including Toyota Motor Corp. and Honda Motor Co. are struggling to resume auto production at their domestic factories after the magnitude-9.0 earthquake on March 11 killed more than 9,400 people and damaged factories. The nation is also facing electricity shortages after a nuclear- power plant was crippled and disruption to road and rail networks. It will take Nissan until mid-April to resume major production at its plant in Iwaki, Fukushima prefecture, Ghosn said. The company's other production sites in Japan are now operating and undamaged, Ghosn said. "Today I can tell you that we have a pretty good assessment of the situation of the company itself," Ghosn said. "We are getting more confident every day." Nissan shares fell 2.9 percent to 703 yen in Tokyo Wednesday. The stock has lost 14 percent since March 10, the day before the quake. Japanese automakers including Nissan will probably have a "tough" time during the quarter beginning April 1, he said. The financial impact from the plant closures will be minimal in the year ending March 31, Ghosn said. Nissan's engine factory in Iwaki, located in the same prefecture where Tokyo Electric Power Co. workers are battling to avert a nuclear meltdown, aren't getting enough water, electricity and gas to operate, Toshitake Inoshita, a Nissan spokesman, said this week. The carmaker is considering shipping engines from Tennessee to Japan, Nissan has said. The factory makes engines for vehicles including Infiniti sedans and Elgrand minivans. "It will take some time at Iwaki to recover," said Ghosn, who plans to visit the plant soon. 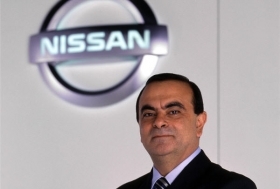 Ghosn, who also leads France's Renault SA, was in Paris attending an executive committee meeting on March 11. Nissan set up an emergency center in Yokohama "within hours" of the temblor off the coast of Sendai, northern Japan, he said. The center includes 100 employees, including top management, who monitor Japan plants on an hourly basis. Nissan resumed operations at six factories on March 21 with some vehicle assembly due to restart Thursday, the company said March 20. Ghosn said the company has no plans to shift production to other countries. Nissan is "committing more than 1 million car production in Japan and this will not change," he said. The automaker expects net income of 315 billion yen ($3.89 billion) in the year ending March 31.